Be the first to share your favorite memory, photo or story of Corenne. This memorial page is dedicated for family, friends and future generations to celebrate the life of their loved one. 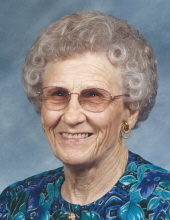 Corenne Simmons, 98, longtime Erie resident, died at 12:15 p.m., Friday, April 5, 2019 at the Prairie Mission Retirement Village in St. Paul, where she entered April 2. For several years she had resided at the Guest Home Estates in Erie. She was born January 14, 1921, at Galesburg, to Ralph J. and Dica (Brooke) Magner. She attended schools in Galesburg, graduating from Galesburg High School in 1939. She attended the Parsons Business College and was employed at the A.S.C.S. office in Erie before her marriage. On April 18, 1941 she and Herman C. Simmons were married at Valley Falls, with the ceremony performed by an uncle, Fred Clark. The couple lived in Erie after their marriage and Herman preceded her in death on February 14, 1995. Corenne was a member of the First Christian Church in Erie, the Southeast Kansas Bottle and Relic Club and of the former Lively Learners Unit. She enjoyed gardening, fishing and reading. She had worked as a Stanley Home Products dealer. Survivors include four sons, Larry Simmons (Beverly) of Erie, Kenneth Simmons (Paula) of Piedmont, MO, Gene Simmons of Surprise, AZ and Stanley Simmons (Francie) of Topeka; six grandchildren, Laurie Mendon (Todd) of Kansas City, MO, Shelly Hamilton (John) of Eudora, Michael Simmons (Nikki) of Topeka, Todd Simmons (Megan) of Ft. Collins, CO, Christian Simmons of Chanute and Kenneth Lee Simmons of Anchorage, AK; eight great-grandchildren, Erinn Fischer (Shine) of Miami, FL, Ryan Mendon of Vail, CO, Jacob Simmons of Topeka, Leo Simmons and Harper Simmons of Ft. Collins, CO, Alissa Hamilton of Lawrence, Brynn Griffin (Chad) of Hockley, TX and Clay Hamilton (Nikki) of Lawrence; four great-great grandchildren, Rhett Griffin of Hockley, TX, Oakley Fischer of Miami, FL, Rylan Hamilton and Gentry Hamilton of Lawrence; and a sister, Adalyn Indihar of Milpitas, CA. Besides her husband she was preceded in death by a brother, Jerald Magner and a sister, Estel Ann Mudd. Funeral services will be at 10:30 a.m., Wednesday, at the First Christian Church in Erie, with Rev. Michael Haggard officiating. Burial will be in East Hill Cemetery. The family will receive friends from 6 to 7 p.m., Tuesday at the Pierce-Carson-Wall Funeral Home in Erie, where friends may call after 1 p.m., Tuesday. Memorials are suggested to the First Christian Church of Erie. They may be left at or sent to the funeral home at Box 182, Erie, KS 66733. Online messages may be left at www.wallfuneralservices.com. To send flowers or a remembrance gift to the family of Corenne Simmons, please visit our Tribute Store. "Email Address" would like to share the life celebration of Corenne Simmons. Click on the "link" to go to share a favorite memory or leave a condolence message for the family.